The Pura Taman Saraswati is a beautiful water temple in central Ubud, accessible from the Jalan Kajeng side street off the main road of Jalan Raya Ubud, just behind Café Lotus. 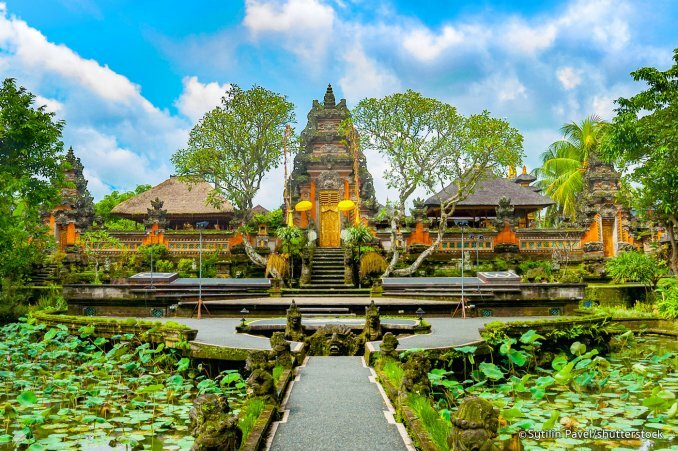 The temple is a great stopover along your leisure walks through Ubud town, offering sightseeing and photo opportunities with its classical Balinese temple architecture and a beautiful foyer featuring ponds filled with blooming pink lotuses. Entry into Pura Taman Saraswati is free but, as with any temple visit in Bali, a sash and sarong around the waist is compulsory. You can also drop into Café Lotus for a minimum dinner cover charge of IDR 200,000 or USD 15, which will get you the best view over the lotuses and to the temple’s open stage, where regular traditional dance performances are held in the evenings from 19:30.